Helps create a watertight seal along a roof’s edges, air vents, vent pipes and screw heads. 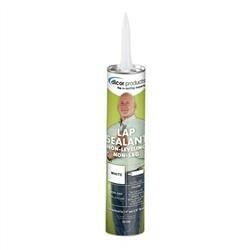 Dicor Products Lap Sealant is a versatile sealant formulated for EPDM roofing but also compatible with most other roofing material, including Dicor DiFlex II™ and BriTEK™ TPO roofing. It offers excellent adhesion to aluminum, mortar, wood, vinyl, galvanized metal and concrete. Continuously seals and remains flexible. Color matched, our lap sealants are UV stabilized to prevent discoloration and deterioration and will not stain or discolor any material to which it is applied.